Sweat the onions, celery and broccoli in the butter, without browning, until nearly tender. Add the stock. Bring to a simmer and cook until the vegetables are tender. Puree the soup, returning the puree vegetables to the stock. Return the soup to the stove. Add the cream or stock till reach desired consistency, taste and season as needed. 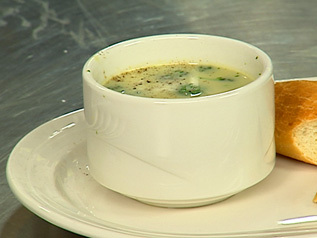 Serve the soup topped with some of the broccoli florets.